https://www.facebook.com/HertfordMeditation = our Facebook page. We have two weekly classes. Tuesday evenings, drop in class. Total beginners are very welcome. You do not need to “be a Buddhist”, or even to know anything about Buddhism. They are held at Millbridge Rooms (opposite the Hertford Theatre), at 7.30 pm to 9.45 pm. Click here for more information about the location. This class is co-ordinated by Rob. We have a class for regulars on Thursday evenings. This is in addition to the existing drop in class on Tuesday evenings, at the same location, and at same time. This class is co-ordinated by Keith. Visit https://www.meetup.com/Hertford-Buddhist-Meditation/ and click “join us”, and RSVP when you are coming to our meetings. You can use first name only, and don’t need a photo. This is an excellent free site, and helps us stay connected with each other. You can also message each other and/or leave comments etc. And of course come along to one of our meetings. We normally get between 12 to 25 people. 1) Mindfulness of Breathing (this is a basic mindfulness meditation. As your thoughts gradually quieten down, you enter a deeper, richer, space). 2) Metta Bhavana (allowing loving kindness to arise, and directing it towards ourselves, a good friend, a neutral person, someone we don’t like, and expand outwards to all beings in the Universe). If we do mindfulness of breathing on one week, then we usually teach metta bhavana the following week, as it is important to do both. If you practise these meditations regularly, and set up the right conditions, they will start to affect your daily life, which can lead to feeling lighter, happier, more joyous, kinder etc. I would definitely recommend that you meditate every day – maybe start at 10 minutes a day , then fairly quickly increase to 20 minutes a day. You will find meditating for 20 minutes a day makes a tangible difference. And then you can make it longer to 30 or 40 minutes, as suits your lifestyle. The classes are taught in a Buddhist context, but you do not have to “be a Buddhist”, or even know anything about Buddhism. The classes do build on each other, and you will go deeper into the practices if you come to several of them. But at the same time I will try and keep them all as self contained as possible, so you can drop in and out, as you please. You do not need to bring anything. We have mats, cushions and chairs available for you to sit on, but if you have a meditation stool or something like that, you are of course welcome to bring it. The first half of the class will be meditation, then we will have a tea and biscuit break, then in the second half there will be some teaching and discussion on meditation and/or Buddhism. It is definitely not about believing in anything. There is no “God” in Buddhism, and we learn from our own experience rather than believing things because it is in some ancient scripture, or because a guru told us to believe it. If you ever want to discuss your meditation practice, or have any questions about Buddhism or about how to get more involved or take things to a deeper level please feel free to ask one of the teaching team, who will almost always be able and willing to give their input. The classes are free of charge, but if you could possibly contribute towards the room (and other) costs, this would be greatly appreciated. Suggested donation is £5. We are not funded from outside, we have to cover all the costs ourselves for this class to continue. message us on meetup.com There is a contact button under our photos . 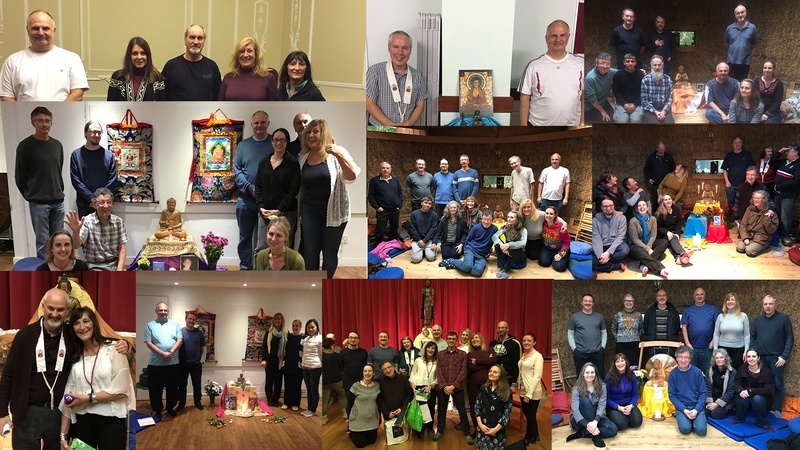 At the Hertford Buddhist Sangha we have strong links with the Triratna Buddhist Community at nearby Triratna Buddhist centres, and especially with the Cambridge Buddhist Centre and the London Buddhist Centre which both offer a full and varied programme for anyone interested in meditation and Buddhism.